Want to join the payroll of a bankrupt retailer this holiday season? Well, has Sears Holdings Corp. got a job for you. The department-store chain posted 75 new positions to its career page Monday, the same day it filed for Chapter 11 in White Plains, New York. Many of the postings are for seasonal, part-time work at either Sears or Kmart stores, including cashiers, sales associates and customer service representatives -- the critical roles that traditionally carry the holiday season. The new listings Monday bring the total number of open jobs on Sears’s website to 4,788. To fill those posts, the company was planning a national hiring day on Oct. 20 at all stores, according to a flier distributed at the Oak Brook, Illinois, location last week. 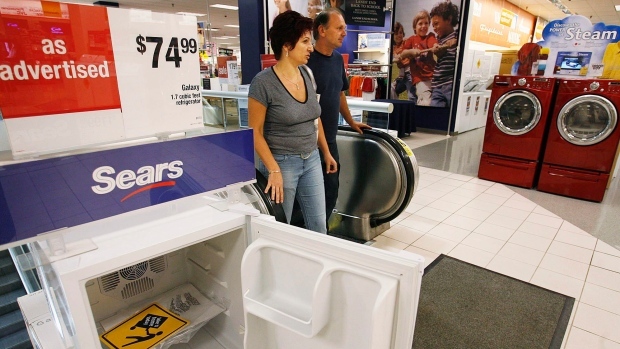 Sears already held a similar event on Oct. 9 at all of its locations. The company did not immediately respond to a query on whether the hiring day was still scheduled after the bankruptcy filing. The event was listed on its careers website as of Monday morning. The retailer’s lenders are trying to nail down financing to help ensure stores are kept open through the crucial holiday season. Sears heads into a court hearing scheduled for later today with key details of its recovery plan still missing. --With assistance from Lauren Coleman-Lochner.